Sri Lanka vs England 5th ODI cricket match has been played in R Premadasa Stadium Colombo on 23rd Oct 2018. This match of England tour of Sri Lanka will be remembered for a long time. Sri Lanka won this match with a big difference of 219 runs. Hi friends, I'm Gyan Ranjan. In this blog post, you will get live cricket score, full highlight, full detailed scorecard and memorable moments of Sri Lanka vs England 5th ODI cricket match 2018. Kusal Mendis, Niroshan Dickwella(wk), Dinesh Chandimal(c), Sadeera Samarawickrama, Dasun Shanaka, Dhananjaya de Silva, Thisara Perera, Akila Dhananjaya, Laksan Sandakan, Kasun Rajitha, Dushmantha Chameera. Jason Roy, Jonny Bairstow, Joe Root, Eoin Morgan(c), Ben Stokes, Jos Buttler(wk), Moeen Ali, Chris Woakes, Adil Rashid, Tom Curren, Olly Stone. The players of Sri Lanka did the amazing performance in this cricket match. Nirosan Dickwella played an amazing inning of 95 runs. He smashed 12 boundaries in his 95 runs. 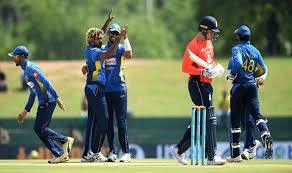 Dinesh Chandimal 80, Kushal Mendis 56 and S Samarawickrama played an inning of 54 runs. Sri Lanka builds a big total 366/6 in 50 overs. Tom Curren and Moein Ali got the 2-2 wickets while Adil Rashid and Liam Plunket got the 1-1 wicket. England got a big target of 367 runs to win this Sri Lanka vs England 5th ODI cricket match 2018. The batsmen of England failed against the bowlers of Sri Lanka. Only Ben Stocks played a good inning of 67 runs. Moeen Ali also contributed with 37 runs but that was not enough to chase this big total. Dushmantha Chameera got earlier wickets for Sri Lanka. He got 3 wickets. Akila Dhananjay also did a great job. He got maximum wickets in this Sri Lanka vs England 5th ODI match. He got 4 wickets in this match. Kusan Rajhita and Dhananjaya de Silva also got the 1-1 wicket. England could score only 132/9 and lost the match by 219 runs in DLS method. The players of Sri Lanka did a great job and won this SLvs ENG 5th ODI 2018 by a big difference of 219 runs.